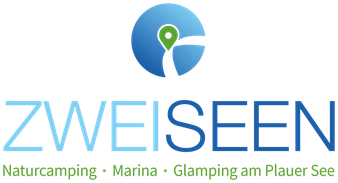 Naturcamping Zwei Seen is the ideal holiday destination for all those who want to spend their holidays directly at or on the water and get to know the "Land of a Thousand Lakes". 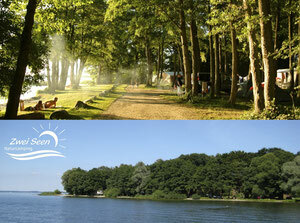 At our place you can experience genuine camping holidays in the midst of unspoilt nature and directly on the lake. Our family-friendly place is perfect for a relaxed and varied holiday with children, but also for individualists and campers with a dog who are in need of rest and relaxation; we offer an extraordinary place directly on the eastern shore of Lake Plauer See, the third largest lake in the Mecklenburg Lake District with the best water quality, many water sports possibilities and direct connection to the Müritz-Elde waterway. The 900 m long beach shore of the campsite offers many small bays with a sandy beach and shallow access to the lake as well as wide shore meadows where you can sunbathe, relax with a picnic blanket or sun lounger, or stretch your hammock between tall trees and enjoy wonderful sunsets every evening. 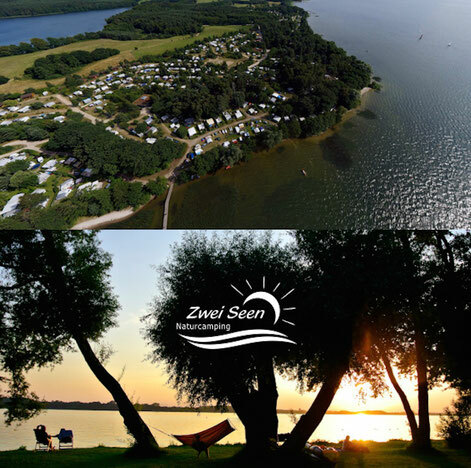 Naturcamping Zwei Seen offers 450 spacious meadow pitches for short-term campers with tents, caravans, motorhomes or campers on a 14 hectare, terraced and partly wooded peninsula directly on the shores of Lake Plauer See. Most of the parking spaces for tourists are located along the 900-metre-long lake shore - either on sunny meadows or under tall trees - or, thanks to the terraced layout of the site, they also have a direct view of the water from the higher plazas on the forest terraces and hills. 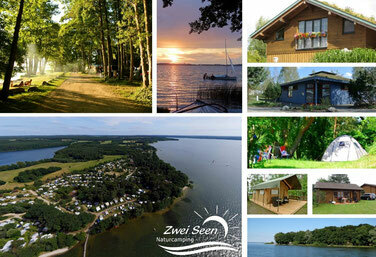 On Naturcamping Zwei Seen (two lakes) all guests have free access to the shores of the lake over the entire length, because there are tree lined meadows with small bays and sandy beaches in front of the campsites. no extra charges for pitch size or pitch. Each guest pays only for the persons and the equipment he brings or sets up on the pitch. In addition, consumption costs may be charged according to individual requirements (electricity, showers, W-LAN, washing machine, dryer). • Our log cabins are equipped for up to 4 people and each have two bedrooms (type A) or one bedroom and a sleeping loft (type B), a living room with open kitchen and dining corner, a bathroom with shower and lavatory and two terraces (east/west). The houses are slightly offset on generous sites on the edges of the campsite with wide view onto a large open meadow. • The caravans for rent with awnings are located on different charming spaces and have individual equipment in three categories. • From the end of May to September, you can also rent glamping accommodations: XXL safari tents with 25 sq m interior on a 42 sq m wooden platform and anything you need for luxury camping – equipped for up to 4 people. • Our 12 sleeping barrels are located on forest terraces with view on the lake and offer a comfortable bedding in a round larch wood barrel. With electricity, heating, and a small wooden terrace with a table & chairs - the perfect camping oasis for two! Your way to us leads you through idyllic landscapes. After you passed the small village crossing in Zislow you go for another 1.5 km along a narrow street. Some are impatient and have turn too early ;-) and landed on the campsite of the Zislow community instead of Naturcamping Zwei Seen. If you keep in mind “Zwei Seen (2 Lakes) = 2nd campsite” and pass the “Wald- und Seeblick-Camp” to your right, you will reach your choosen destination within 400 meters! There is siesta and night rest in the entire area from 1 to 3PM and 10PM to 7AM. During this time, the gate will be closed and entering or exiting is not possible. Spaces and rental accommodations are available from 3PM.